For the ninth consecutive year, rock climbers of all levels will gather for clinics, climbing and, of course, the clinking of pint glasses at the Red Rock Rendezvous, a three-day event that’s gearing up to be the country’s largest climbing festival of 2012. 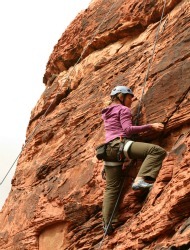 Registration for the festival, which takes place from March 30-April 1 at Nevada’s Red Rock Canyon National Conservation Area, one of the country’s premier climbing destinations, is limited to the first 1,000 registrants. About 400 spots are still available, according to event coordinator Phil Bridgers. On tap for the weekend: all types of clinics for newbies and skilled climbers, from bouldering to rescue and even trail running; rubbing elbows with some of the top names in climbing (including Lisa Rands and Peter Croft); and plenty of Belgian beer each night. Registration, which starts at just $99 for limited participation, includes an opening celebration on Friday night, a dinner buffet followed by what Bridgers calls a “wicked party” on Saturday night, featuring a DJ and competitions including tug-of-war and crash pad derby, plus a pancake breakfast on Sunday. Throughout the weekend, there are also environmental service projects benefiting the conservation of Red Rock Canyon and Spring Mountain. Event proceeds will benefit the Access Fund, a national nonprofit organization dedicated to keeping climbing areas open and conserving the climbing environment. Beginning climbers should check out the UClimb Intro to Climbing package, which is catered to newbies with personalized instruction and small groups. The package (which costs $179 without gear; $349 with gear) includes one full day of instructions on the basics, a full day of climbing on Saturday and a two-hour educational clinic. A women-only clinic also is available. And to really get into the spirit of the event (and save some cash in the process), consider pitching your tent camp with other festival attendees at nearby Spring Canyon Ranch. To start planning your trip, check out our Nevada Travel Deals or our Sports & Adventure Travel Deals.